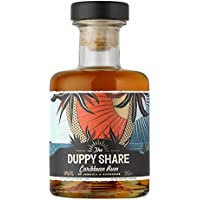 The Duppy Share are leading a rum revolution with their golden Caribbean rum from the islands of Jamaica and Barbados. Founded in London by George and Jess, they are taking the world of rum by storm with their fine blend and mischievous spirit. Duppies are Caribbean ghosts, originating from the island of Jamaica and known to have a special love of rum. Legend has it that the dark Duppy spirits swoop between islands stealing the best share of the rum as it's left ageing in old oak barrels. They may then quite possibly head off into the sunset to have a massive party. This is The Duppy Share.